This page shows more examples of Randolph Caldecott's pictures, from some of his sixteen "Picture Books". These were published annually, in pairs, from 1878 until his death in 1886, always in time for Christmas: they were forerunners of the later Christmas Annuals. They were originally priced at One Shilling (5 pence in today's British currency). 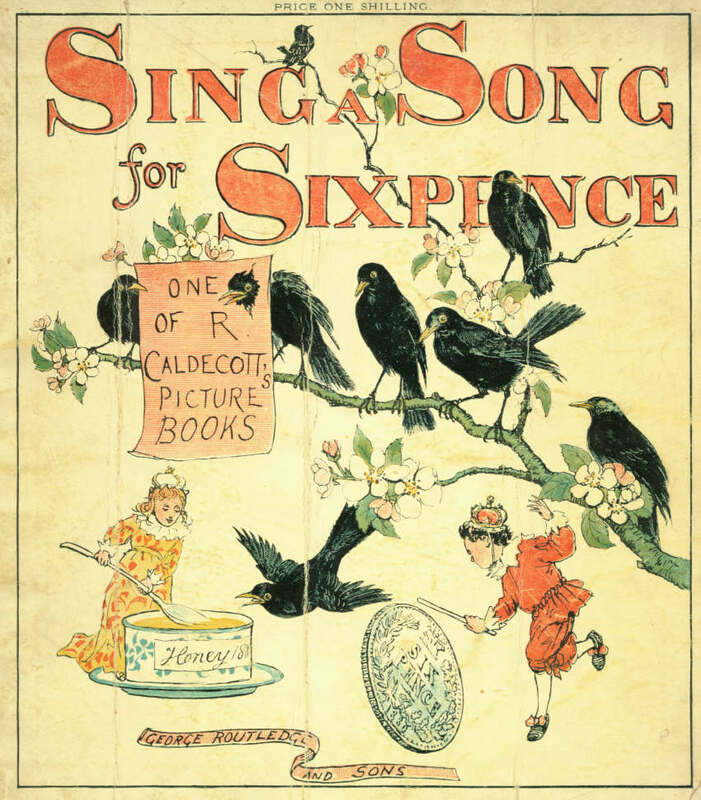 Randolph Caldecott is believed to be the first author/illustrator to have negotiated with his Publisher to receive, instead of a fixed fee, a "Royalty" per book sold: he received one old Penny per book (there were 12 Pence to the Shilling). The first print run was a cautious 10,000 copies. They were so popular that by July 1886, 5 months after his death, over 800,000 copies had been sold. To reduce download time, each picture is shown in "thumbnail" size. Click on it for a larger version. Some of the 16 "Picture Books" are not really Nursery Rhymes, but for completeness we have listed them all here, in order of publication. Those in italics on this page are (or will be) described more fully on the "Works" page or elsewhere: click on any underlined title for more info. The Frontispiece is shown here. Compare it with our photo of the house which Randolph used for his pictures in this book: click here. For another picture from this book, click here. If you can download pictures quickly, click on the one to the left and look for the artist's initials. "R C" is at bottom left - and another set of initials, "E E" is at bottom right. Edmund Evans was the engraver and printer whose careful work (in the original Routledge editions) ensured that Randolph's pictures appeared as intended. In the Frontispiece, shown here, Randolph has depicted himself "Sore sicke...and like to Dye". Humorous to those who recognised him - but sadly all too prophetic of his early death only 7 years later. This, with the previous 3 books, was re-issued in Randolph Caldecott's Picture Book. The original pictures from which this book was published were bought by Beatrix Potter's father for GB£ 80. When Randolph published his book, there was some controversy about the text. Had he plagiarised someone else's work? Why had he not given due credit to the author? The truth was that he used an old Lancashire dialect version of a rhyme which, in various versions, had been circulating for centuries. For two of the pictures, a comparison of original and later editions, and a sample of the text, click here. Another picture is on one of our Postcards pages: click here. 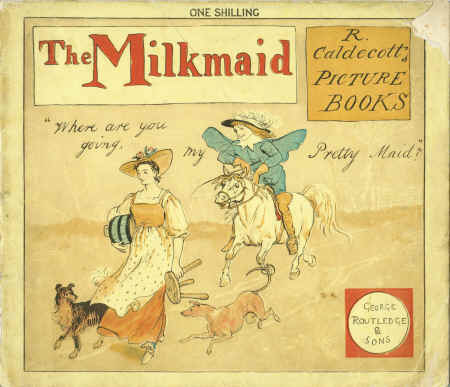 When Randolph Caldecott produced this book, the Nursery Rhyme on which it was based seemed to be just a children's song. But, only 60 years previously, when the rhyme about "four and twenty black birds" first appeared, it was full of political significance, based on the "Cato Street Conspiracy" (1820) in which 24 men (one of whom was black) plotted to murder the entire Cabinet at dinner one night. When they were discovered, many of them began to tell about the others in the hope of saving their own lives - hence "the birds began to sing". Acts of Parliament had just been passed to restrict public meetings and to take action against any literature considered "seditious", so there was an upsurge in innocent-seeming poems (or actions) with hidden meanings. This, with the previous 3 books, was re-issued in Randolph Caldecott's Picture Book No. 2. For another illustration, together with a modern parody of it, click here. This is the final picture from the book and the rhyme. It is clear that the hero of the rhyme is now much grander than the Farmer's Boy that he used to be! For reproductions of some pictures from this book, see our Postcards page. An interactive version of this, showing all the illustrations with sound and music, is available on a Japanese Web-site (in English or Japanese). To visit it, click here. 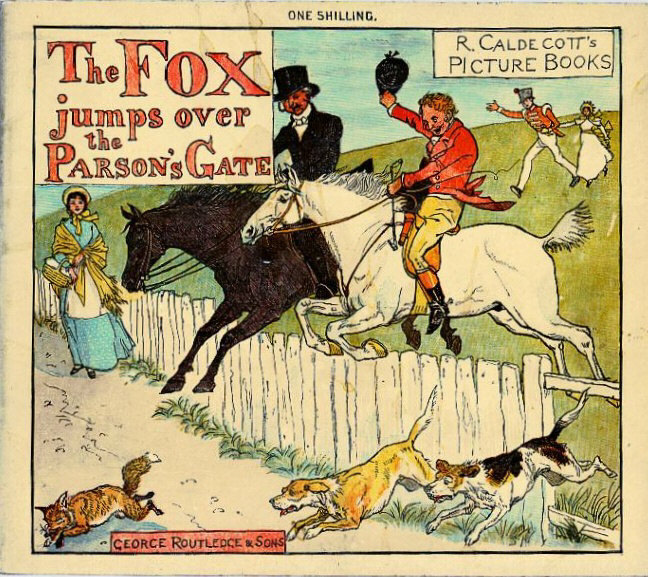 The illustrations in this book, showing animals clothed and behaving like humans, indicate clearly how Randolph Caldecott influenced the work of Beatrix Potter. Two of Randolph's pictures still hang in her house in the Lake District, UK. For a watercolour sketch used for this book, click here. 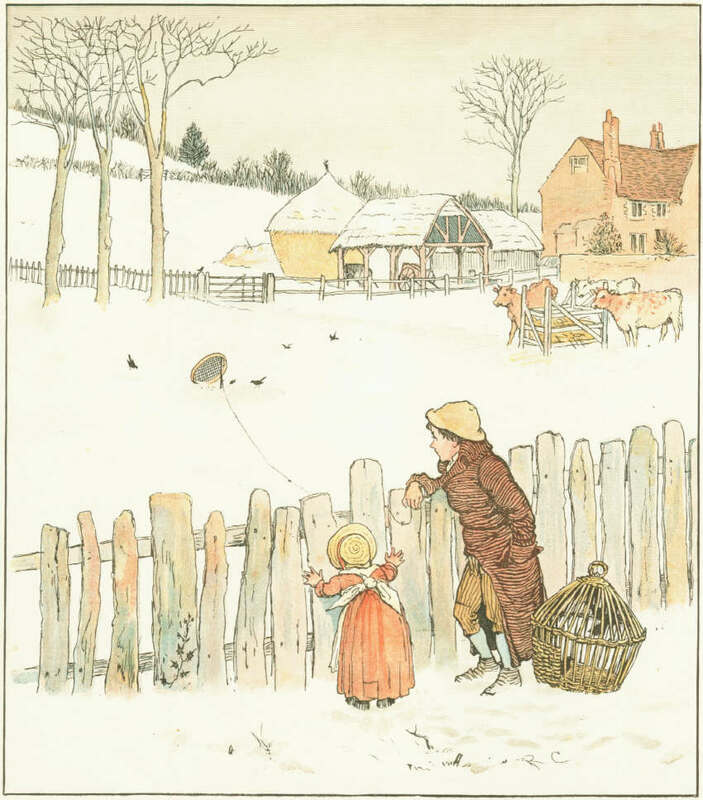 A detail from a colour picture in this book is on our "Family" page: click here and then click on the small picture to see the whole, enlarged, picture. For the last picture from this book, click here. This was a traditional song, dating back to around 1670. The original had more verses than are reproduced in Randolph's book. The phrase " 'Twas the Fiddler Play'd It Wrong" is a line from the song and was the subject of an oil painting by Randolph; see our "Buying" page. For one of the illustrations to the first of these rhymes, click here. Jack and the Beanstalk (1886, published after Randolph died). The words of this version were written, in "English hexameters", by Hallam Tennyson. Randolph Caldecott had only produced rough sketches by the time of his early death, but the book was published with these sketches. Randolph was better known than Hallam Tennyson, and so Randolph's name on the cover is larger than Hallam's. published by Macmillan & Co (London & New York) instead of Routledge. For other pictures, see our "Works" page. Source of info at top of this page on copies sold: Obituary article by William Clough published in The Manchester Quarterly, July 1886, quoting the publishers, Messrs. Routledge. Compare this with the figure of 867,000, from another source, for sales of only the first 12 of the books by 1884.